1. In a wok, heat 2 tablespoons of olive oil. 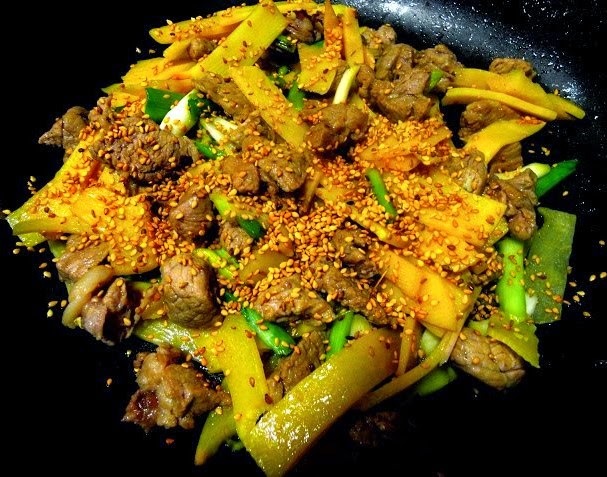 Stir fry the beef until it´s cooked through. Transfer the beef to a bowl and set aside. 2. In the same wok, add the remaining tablespoon of oil. Heat and add the minced garlic, spring onion and bamboo shoots. Stir fry 2-3 minutes. Add the fish sauce, oyster sauce, salt and pepper. Stir in the sesame seeds.